Sony has chosen CEATEC in Japan to show off a whole host of new HD kit. 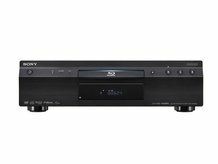 While the company again gave its Profile 2.0 BDP-S5000ES player – last seen at this year's IFA show in Berlin – it was the announcement of five new players that must have got the folks in Japan salivating. And Japan only, however; as all the players are destined to be released in the country and nowhere else. The BDZ-L95, BDZ-T75, BDZ-T55, BDZ-T30 and BDZ-X100 all act as players and Blu-ray burners. Each has been given an internal hard drive, with the BDZ-T75's clocking in at 320GB. The BDZ-T30 is considered the entry level of the bunch, with a mere 120GB. All players also have the capability to record AVCHD, so homemade movies shot on this codec are very much welcomed. Although these machines may never see the light of day in Europe, it is interesting to see what sort of tact Sony is going for. Adding burning capabilities to its players may give consumers more reason to go out and finally embrace Blu-ray.